As each revelation rocks the foundations of the once proud Parmalat empire, there are fears a much-loved part of the disgraced conglomerate could be lost. The Italian town of Parma could see its football team left in ruins, in a football financial disaster which makes the plight of Leeds United seem strictly small-time. 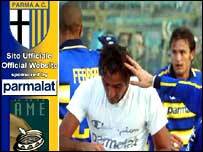 Parma is a club from a small town of 170,000 people that has risen above its natural station in Italian football, or Calcio, thanks to the millions that now-insolvent Parmalat have pumped in over the past 13 years. The club, 98% owned by Parmalat, has risen from a provincial team to a leading name in European football since the Tanzi family took over in 1991. Imagine a provincial English club like Luton Town winning two Uefa Cups and one Cup Winners' Cup, as well as losing another CWC final, and all done with a team packed full of international players. Yet that is what Parma did, backed by Parmalat's cash, in the 1990s. After a period in the relative doldrums, the club has revived in the past two seasons and is pressing for a Uefa Cup place. "Every one in Italy loves Parma," Filippo Maria Ricci, London correspondent for Italian paper La Gazzetta Dello Sport told BBC News Online. "No-one can believe what has happened - in Italy everyone loves conspiracy theories so find it very hard to understand how the company which owns Parma could collapse in just a few weeks. "The club grew really big under the Parmalat ownership, then slipped down the ranks to become a "normal club" for a few seasons, but really seemed to be coming back again, despite selling big names like Buffon, Thuram, Crespo, and Veron." But now it seems the rags-to-riches fairytale really is over, and Parma, deprived of its main source of income, is faced with having to drum up enough cash from somewhere to see out the season. Former club president and Parmalat founder Calisto Tanzi is still detained by investigators probing a huge hole in the company accounts, and his son Stefano is expected to quit as Parma club president this week. Things look ominous - Parma lost 77m euros (£54m) last year, and owes Parmalat 54.5m euros, a situation which could yet cause its liquidation. The club had intended to tap shareholders for a capital increase, but that plan collapsed when Parmalat was declared insolvent. And an Italian investigator warns: "Wherever we go at Parmalat, at (the football club) Parma Calcio... we find false documents and debt and people tell us of other false documents and debt". Administrators hope to hold a crucial shareholders' meeting at the football club on Friday, 9 January. Meanwhile the intentions towards Parma of Enrico Bondi, the rescue manager brought in to revive Parmalat, remain uncertain. 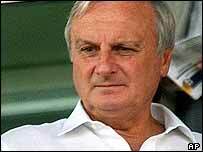 But a confident Mr Ricci says: "I think Parma will survive - in Italy clubs always survive. "There is a very Italian way of doing things, that I can't explain, which is different from England, but Parma will not be allowed to go bust. "They are in the positive position in that they have very good players to sell, including five members of the Italian under-21 team. "I think they will have to sell these "crown jewels" to survive." Pick of the players is 21-year-old Brazilian striker Adriano, who is said to be worth more than 20m euros. He is part-owned by Inter Milan who also have the right to buy him for a lower price than other clubs. Says Mr Ricci: "Adriano is great, a guaranteed success on the field when he recovers from his current injury, and I think he will also be a guaranteed way of raising funds for the club. "The club will probably cash in on him in June, selling to Inter, who I think have already decided to buy him, thus earning much-needed millions for Parma. "The best scenario would be for Adriano to make sure they finish as high up the table as they can, before bringing in millions of euros when he is sold." Already Japanese midfielder Hidetoshi Nakata has gone from Parma to Bologna on loan, and more are set to follow him out of the door. As well as Adriano, other attractions include goalkeeper Sebastian Frey, and outfield players Daniele Bonera, Matteo Ferrari, Marco Marchionni, and Alberto Gilardino. Mr Bondi has not as yet said the club must immediately sell the players or other assets, such as the training ground. "Another positive sign is that he has indicated he wants former Italy national team manager Arrigo Sacchi to stay on as director of football, in charge of everything. "This is a reason why I do not think Mr Bondi will let the club go out of business," says Mr Ricci. Parma's managing director, Patrick Nebiolo, has said a rescue plan might involve Parmalat waiving the debts owed by the club, and also said new shareholders might come forward to take a stake. A recapitalisation involving debts is "one of the possibilities" also being studied, but more will become clear at the general meeting to discuss capital on Friday. A sum of 40m euros may be enough to keep the club alive till the close season, when there could then be a fresh fight to find funds for season 2004/05. Mr Ricci says: "If the club survives and the team can keep playing they should do well and end the season in quite a decent position. "If they did that, then there are no strict regulations in Italian football which could see them relegated just because they were in serious financial difficulties. "Even if there were, ways would be found to keep the club up in the top division." But he warns: "The problems may arise next season when they are left with a team without its best players, all sold off to keep the club in existence. "But whatever happens on the playing side, the club will be saved somehow." 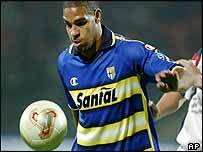 Parma briefly put the financial scandal behind them with a 2-0 win against bottom-placed Ancona on Tuesday. "The Italians act in a very ruthless way towards clubs that go bankrupt"